As soon as old Man Wallace returned in the latter part of 1949, I got a new assignment working with the Petroleum Engineers. My job was to check out wellhead pressures on all the wells in the Dammam Field, which was about 40 at that time. If no pressure was noted on the annuli (spaces between different strings of casing at the wellhead), I drove a tanker full of water to the annuli and measured how much water was used, if any, to fill the annuli. I had to record all of this information in the wellhead record book in the Petroleum Engineer's office. My next assignment was an Assistant Petroleum Engineer, working under Jim Kerr. We wrote programs for wells that had to be worked over due to too much gas or water production, a hole in the casing, a leak at the surface, or a leaky packer between two producing zones. So, I used to jokingly refer to myself as a "Doctor of Sick Oil, Gas or Water Wells." And to this day, I still do. About this time my little friend Byron Green arrived in the field after graduating from University of California at Berkeley. He was with us in training at San Francisco, but was a half year behind us in school. He went to work in workovers with me and I moved from my old barrasti to a new one, in the same building as Byron. We became good friends until he died. I did not realize how angry and upset I could get with my boss until Byron asked me one day, "Do you always talk that way to your boss?" To which I asked, "What do you mean"? Well, he said, "You told him, you dumb ?? ?, can't you even understand that ?!?" He recalculated a cement squeeze job I had done and said I was wrong, even though I explained to him we were using 112# sacks of cement, not 94# per sack. This made the mixed volume different. Needless to say, my boss did not care much for me after that. Byron and I had two workover rigs to chase, and they moved every few days. We had to prepare the programs, witness all cementing, logging, testing, completions and killing operations. So we worked around the clock, on call 24 hours a day seven days a week. The winters were terribly cold and windy and the summers hot and humid. We drove out to Abqaiq one day in our company car and ran out of oiled road very quickly out of Dhahran. The rest of the road to Abqaiq was oiled at one time, but the roads kept getting covered up by the shamals, winds, blowing sand onto them. They had big busses for travel between the towns and a big trailer pulled by a large Kenworth truck to take the Saudis home to Qatif, Dammam and Hofuf on weekends. The weekends were half day on Thursday and all day Friday. Thursday noon was payday for the Arabs and they were paid three riyals per day; payable in large silver one riyal coins. They usually took off their little caps and collected their riyals in their caps. 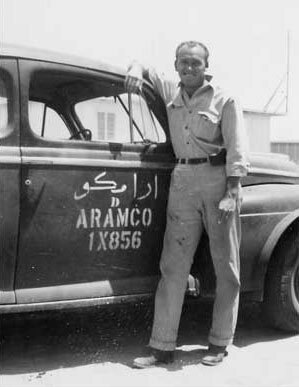 Abqaiq was a small camp built around the Abqaiq Oilfield, as Dhahran was around the Dammam Dome and Oilfield. 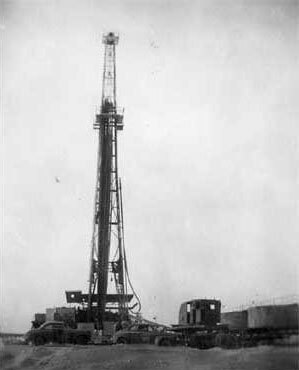 At this time, the drilling rigs were still drilling in Abqaiq and drilling had also started in the Ain Dar field, about three-fourths of an hour west of Abqaiq. The road from Dhahran to Ras Tanura was just an old two lane road that was oiled, full of potholes and donkey carts. These were a real hazard after dark. Ras Tanura was a small Refinery town with a small Saudi camp outside, as did Dhahran. Letters took so long to get to us from the USA and we had no long-distance telephone service to the US. But, we could take a three hour boat ride on an Aramco outboard motorboat to Bahrain and make a call from there. 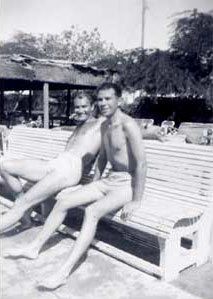 The only place for expats to stay was at the BOAC Guesthouse. Then in the evening, we all went down to the Telephone Company in Manama and got on the waiting list for a radio-telephone call to the USA. When my turn came, I could hear the operator, "Hello London, Hello New York, Hello Oklahoma City, Hello Ponca City, and then I heard the Ponca City operator say, "Sorry that line is busy" and she immediately broke off the connection. So I lost my place in line and time ran out; I never did get to talk to Jo. The next morning I left on the boat for another three hour boat ride to the Al-Khobar tiny boat dock. What a rotten weekend that was. Al-Khobar was a tiny practically one street shopping area, with tiny shed-type shops. We had no place to eat there, but there were a few teahouses. Some of the folks tried that, but I never did. The port of Dammam was very small and there was a sandy road from Al-Khobar to Dammam. 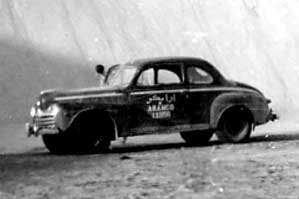 We used our Aramco cars with big sand tires to drive on the sandy roads. There were three classes of employees in those days. The American Camp with family and bachelor housing, which included a small men's beer hall, a family snack bar and a small theater. 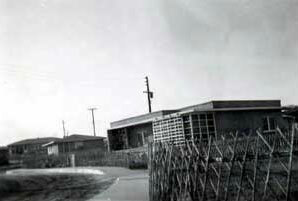 There were also golf courses, tennis courts and swimming pools. 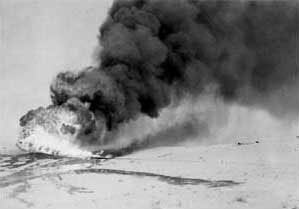 Then there were intermediate employees, primarily Italians at first, and they had a tent-type camp, with wooden floors and about three feet of wood sides from the ground up, with a tent covering down south of Al-Khobar called Al-Azizeyah. Some of the Italians that worked in the Petroleum Engineering Lab with us would invite us down for a real Italian spaghetti dinner with Chianti Wine. That was always a treat. Saudi camp consisted of several rows of tents, similar to those at the intermediate camp in the sand east of the Dhahran Senior Staff Camp. Many of the wives still in the states kept telling their husbands to hurry and get them over to Saudi; they would even be willing to live in a tent just to be together. So once in a while when a new wife arrived, their husband would drive them into the row of tents and pretend that was their new home. That really did not go over so well, since the gals were exhausted from their long trip over from the USA. I was finally called into Personnel in March 1951, 21 months after I arrived in Saudi Arabia, and I was told that I had enough Housing Points to rate family housing. Housing points were based on so many points for your job classification plus so many points for each month in the field on single status. I was shown the house that had been assigned to us and I made all kinds of notes for Jo as to sizes of the rooms, colors of the rooms, floors, curtains, and etc. I sent Jo a telegram and told her to meet me in New York at the Waldorf Astoria Hotel because I was coming in on KLM with no stopovers. I gave her my arrival time and date. It was a long ride home to New York; one of our other Engineers, Preston Dillon, was my traveling companion. Jo was waiting for me in New York where we spent just a couple days. We took off to Ponca City to see the house that Jo had purchased with my VA loan and for me to get reacquainted with Susan and little Bob. Boy, was I ever glad to get home. Jo asked me what I wanted for dinner and I said a green salad, lots of fresh milk, fruit and a big steak. We had a pleasant vacation, enjoyed being reunited and I spent some time getting to know Jo's Buxton family better. We had to buy a bunch of clothes and other things to take to Saudi to last for two years, as we would not be back in the states until then. We finally completed all of our shopping, visiting and Aramco family processing and caught the plane to New York. We picked up some papers and then headed for Saudi Arabia as a family, together once again.